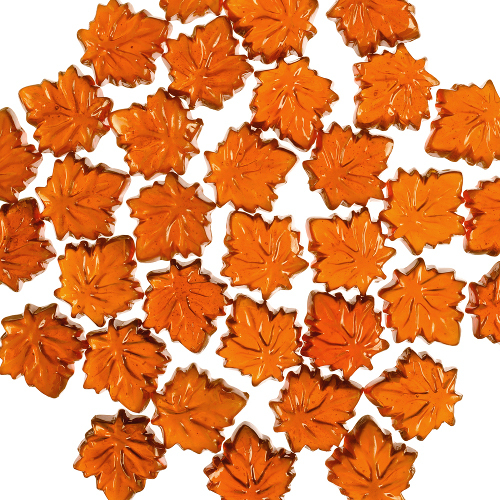 The rich flavor and deep color of these translucent, leaf-shaped hard candies come from pure maple syrup. Great for sucking or crunching, or try dissolving one in your next cup of tea for a portable splash of maple. Ingredients: Maple syrup (41.2%), glucose, sucrose. Misc. info: Glucose is derived from corn. Gluten-free info: Contains no gluten ingredients. Additional information from the manufacturer: Facility is gluten-free. Approximately 70 individually-wrapped pieces per pound. I got my order in yesterday and chose the maple candy as one of my free samples and they are so good! I highly recommend this candy to everyone if you love maple syrup (like I do) then you will love these. My Canadian girl friend got a bag sent to me for my birthday ...these are amazing! Perfect size and color and the taste is perfect...not too sweet ....Im hooked... Wish you sold them in San Clemente Ca. I received one of these as a sample with my first order to the Natural Candy Store and knew I had to order some the next time I placed an order and did. Everyone in my family loves them and they're only 22 calories per candy so a little piece of sweetness that satisfies the sweet tooth and tastes wonderful to boot!